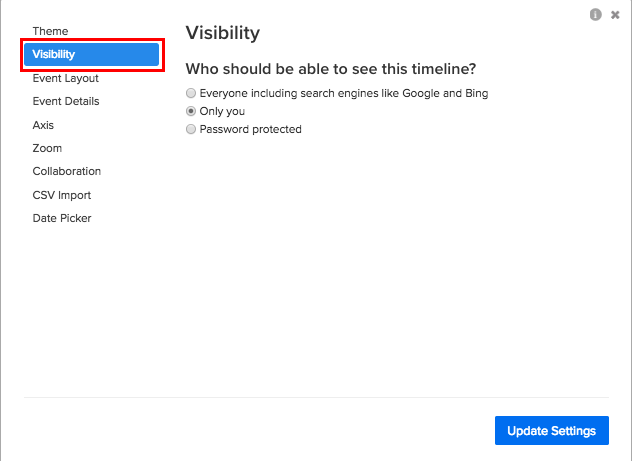 Everyone including search engines - Anyone on the internet can see your timeline (this is the default for new timelines). Your timeline will be visible in search engines like Google and Bing. Only you - Only you can see the timeline while signed in to your account. Password protected (only you and visitors who have an access password) - Same as private, but you'll also be able to specify a password which you can give to others along with your timeline's URL so they can view it. If you are a student and are using your teacher's Preceden account, your timelines are private and cannot be made public. The only person, other than yourself, that can view your timelines is your teacher.